Developed by Piasa Games for iOS devices and Android phones, Don’t Eat People is in the same vane of games like Flappy Bird in that it’s insidiously simple. You control a giant monster who eats cows, which are stampeding over a cliff towards you. The problem is that the local tribesmen have decided that they want in on the party that the cows are running to and are happily leaping towards your open jaws. As the game title suggests, you don’t want to eat these dudes. Eat one guy, and the games over. 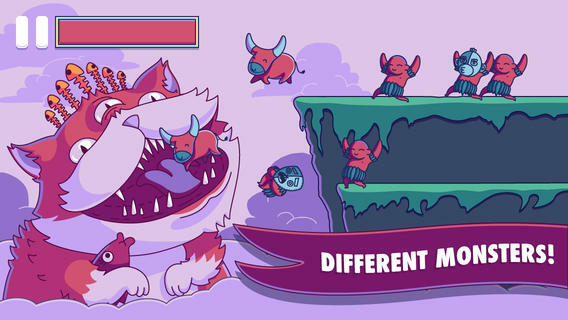 To avoid eating people you touch the screen, closing the monsters mouth to avoid eating the people. However there is also a bar representing the monsters breath, which runs down as long as the monsters mouth is closed. So when this bar runs down the mouth opens, right as a guy jump into your mouth, ruining your high score streak at the worst possible time. The cows have a few different effects, with a black cow that gives you bonus points but as a result it summons a crowd of people, or a gold cow, which summons a stampede of cows. These elements change up the simplicity and add a degree of depth to what is otherwise touching the screen over and over again. This simplicity makes the game very accessible; there’s no reason why you can’t beat your score, so you’re always thinking “just one more game! I have it this time!”…Unless you have to stop to write a review for a website of course! But simple controls need to be backed up by the visuals, which is where Don’t Eat People shines. The graphics are cartoony and colorful, and feels like a lot of attention was put into this area to give the game an identity. The interesting thing is your monster, which changes with each game and which takes up most of the screen, is constantly different and rewards multiple playthroughs. The music is pretty sweet too; it’s got that Crash Bandicoot tribal vibe, though it doesn’t feel like it’s trying to emulate that games aesthetic, giving it it’s own identity. Don’t Eat People is a simple and fun game, and it’s also FREE! So you have no excuse not to play! If you’re playing to beat your own score, or trying to top your friends latest accomplishment, there’s something for everyone. It’s simple, fun and has a lot of charm! Check it out and judge for yourself. This entry was posted in Uncategorized and tagged Android, Flappy Bird, iOS, Mobile, Piasa Games, Video Games. Bookmark the permalink.